I don't know about you but my food shopping seems to have been getting more and more expensive as the weeks go by, yet I seem to have less in my trolley! I have to admit though I am guilty of falling into the trap of "offers" and "deals" then end up losing track of what actual meals I've purchased, yet I always seem to have an abundance of snacks etc. This usually then results in several trips to the supermarket in the week buying ingredients to complete meals for the week, wasting more and more money in the process. So in a bid to save money and be a bit more organised I have decided to start meal planning! 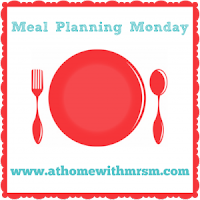 I have also joined up with the Meal Planning Mondays linky so each week I will share with you our meal plan for the week and what we will be eating. I am hoping this will help keep me on track, of course I am not totally unrealistic, I realise there are days when plans may differ or change for various reasons but I think a meal plan will definitely help us keep more organised and keep the expensive "quick trips" to the supermarket down! Chicken fried rice with spring rolls and curry sauce. These are necessarily in the order we will eat them in but it means I know what I need to buy at shopping and it means we will have all of the ingredients for all of the above meals and we can all pick which one we fancy on a day to day basis. Do you have any favourite meals to share as I would love some new ideas! Saving money and have more inspiration rather than just grabbing something on the day is such a good idea. That's a good idea to meal plan, I leave this to my husband as he does the shopping and the cooking, lol that sounds bad but he's a much better cook than me!! Every single week I say I'm going to do this, and then I don't. We are big fans of stir frys! Lots of veg and only take 15-20 mins to cook. I need to start this back up again. We end up eating the same things and food runs out mid week.